Personalized Wall Letters for Your Baby Cocoa Nursery - Make your boy's room special with our personalized wall letters. 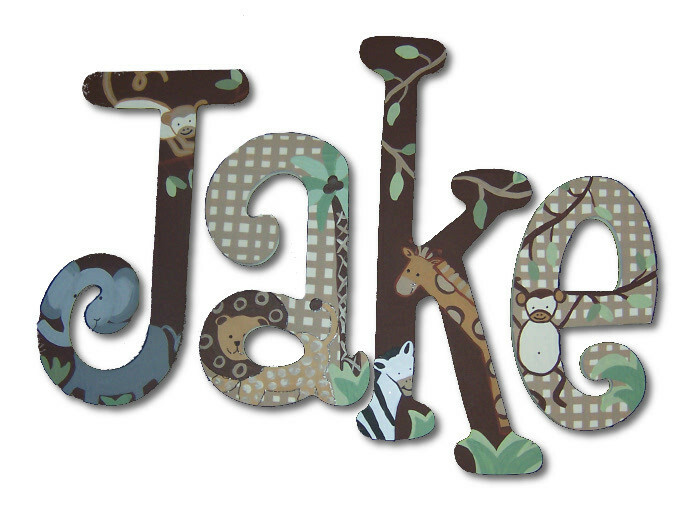 We can customize the colors or design on these Baby Cocoa jungle letters to coordinate perfectly with your space. After all, personalized wall letters should reflect the style and personality of you and your little boy. Just tell us your insp iration, and our talented artists will bring it to life. Our wall letters are such a fun and attractive way to personalize a boy's bedroom, bathroom, or play area. Each jungle theme wall letter is handpainted with top quality paints and sealed with a non-toxic, non-yellowing varnish to ensure that your little boy enjoys his personalized wall letters for years to come. Full Description Personalized Wall Letters for Your Baby Cocoa Nursery - Make your boy's room special with our personalized wall letters. We can customize the colors or design on these Baby Cocoa jungle letters to coordinate perfectly with your space. After all, personalized wall letters should reflect the style and personality of you and your little boy. Just tell us your insp iration, and our talented artists will bring it to life. Our wall letters are such a fun and attractive way to personalize a boy's bedroom, bathroom, or play area. Each jungle theme wall letter is handpainted with top quality paints and sealed with a non-toxic, non-yellowing varnish to ensure that your little boy enjoys his personalized wall letters for years to come.